Up until the nineties, if a family could afford it, the first consideration when a child was graduating from high school was always which school in Metro Manila. There were colleges and universities in Batangas; but the general perception – whether valid or not, I leave it to the reader to decide – was that these schools could not match up to those in the capital. These days, that perception is simply not valid at all. Colleges and universities in Batangas not only match up to but in some cases even do better than their counterparts in Metro Manila. It is not only the quality of instruction that has improved tenfold; many of the higher education schools in the province have also spruced up their campuses with modern buildings and facilities. 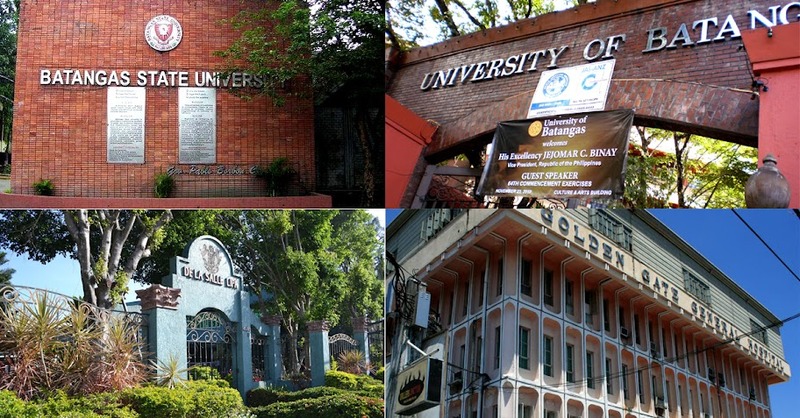 In so doing, these schools have rendered going to Metro Manila for higher education something of an impracticality. Although this article ranks the schools according to performances in degree program licensure examinations, what it really intends to achieve is to show how well most of the schools are actually doing. The results are tabulated from FindUnivesity.ph, a leading web site in guiding students and their parents into finding suitable colleges and universities. Weighted ranks are given according to how each school has performed in the licensure examinations that its graduates had taken. The initial table showing the overall ranking of nine Batangas colleges and universities should NOT be seen as gauge of the schools’ quality, as indeed the number of licensure examinations considered has a bearing on the weighted rank. Also, each school has its own unique specialties, so will naturally perform better in these than in others. Thus, it is the ranking of each school in each program that should be more valuable to students and parents who are considering options for collegiate education. As a footnote, the performances of schools in programs not offered by any other school in the province have not been included. Also, please note that the passing rates are for FIRST-TIME examination takers only.